For footballer, see Ibrahim Babangida (footballer). Ibrahim Babangida was born on 17 August 1941, in Minna, Niger State, to his father Muhammad Babangida and mother Aisha Babangida. From 1950 to 1956, Ibrahim Babanginda attended primary school. From 1957 to 1962 Babangida was educated at the Government college, Bida, Niger state, Nigeria. Babangida joined the Nigerian Army on 10 December 1962, when he attended the Nigerian Military Training College (NMTC) in Kaduna. Babangida received his commission as a 2nd Lieutenant as a regular combatant officer in the Royal Nigerian Army (a month before it became the Nigerian Army) with the personal army number N/438 from the Indian Military Academy on 26 September 1963. Babangida and General Mohammed Magoro were among the first batch of Nigerian graduates from the NMTC who attended the Indian Military Academy from April to September 1963. Others in subsequent batches from Babangida's NMTC class include Garba Duba and Ibrahim Sauda. Babangida furthered his armoury training from January 1966 until April 1966 by enrolling in Course 38 of the Young Officers' Course (ARMED) in the United Kingdom where he received a four-month course in Saladin and gunnery. From August 1972 to June 1973, he took the Advanced Armoured Officers' course at Armored school. He attended the Senior officers' course, Armed Forces Command and Staff College, Jaji, from January 1977 until July 1977 and the Senior International Defence Management Course, Naval Postgraduate school, U.S., in 1980. He was heavily involved in quelling the Nigerian coup of 1976, when he was to ‘liberate’ a radio station from one of the coup plotters, Col Buka Suka Dimka (a close friend of his), to prevent him making further announcements over the air waves. Although he did prevent further broadcasts, Col Dimka managed to escape. He attained the following ranks: Second Lieutenant (1963), Lieutenant (1966), Captain (1968), Major (1970), Lieutenant Colonel (1970), Colonel (1973), Brigadier (1979), Major General (1983), and General (1987). Babangida also served as a member of the Supreme Military Council from 1 August 1975 to October 1979. Babangida, then a lieutenant with the 1st Reconnaissance Squadron in Kaduna, was one of the many officers of northern Nigerian origin who staged what became known as the Nigerian Counter-Coup of 1966 which resulted in the death of Nigeria's first military Head of State, General Aguiyi Ironsi (who had taken power in another coup earlier that year), and his replacement with General Yakubu Gowon. Babangida was the Chief of Army Staff and a member of the Supreme Military Council (SMC) under the administration of Major General Muhammadu Buhari. Babangida would later overthrow Buhari's regime on 27 August 1985 in a military coup that relied on mid-level officers that Babangida had strategically positioned over the years. With the oil revenue, Babangida created the Federal Environmental Protection Agency in 1985. He created eleven state governments and several local government councils. He had the Toja Bridge in Kebbi constructed. He also created the Jibia Water Treatment Plant and the Challawa Cenga Dam in Kano. In 1992, constituted the Oil Mineral Producing Area Development Commission. Babangida also increased the share of oil royalties and rents to state of origin from 1.5 to 3 percent. In January 1986, Nigeria joined the Organisation of Islamic Cooperation (OIC) as its 46th member. The OIC was established in 1969. The chief of staff supreme headquarters, Commodore Ebitu Okoh Ukiwe, was removed and replaced from his post as chief of staff supreme headquarters by Babangida, because Ukiwe was opposed to the registration of Nigeria, a secular country, in the OIC. On 23 September 1987, Babangida created two states: Akwa Ibom and Katsina. On 27 August 1991, Babangida created nine more states: Abia, Enugu, Delta, Jigawa, Kebbi, Osun, Kogi, Taraba and Yobe. Bringing the total number of states in Nigeria to thirty in 1991.
relaxation of restraints on foreign investment put in place by the Gowon and Obasanjo governments during the 1970s. Between 1986 and 1988, these policies were executed as intended by the IMF, and the Nigerian economy actually did grow as had been hoped, with the export sector performing especially well. But falling real wages in the public sector and among the urban classes, along with a drastic reduction in expenditure on public services, set off waves of rioting and other manifestations of discontent that made sustained commitment to the SAP difficult to maintain. Babangida subsequently returned to an inflationary economic policy and partially reversed the deregulatory initiatives he had set in motion during the heyday of the SAP following mounting political pressure, and economic growth slowed correspondingly, as capital flight resumed apace under the influence of negative real interest rates. On 22 April 1990, Babangida's government was almost toppled by a failed coup led by Major Gideon Orkar. 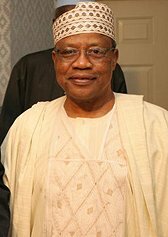 Babangida was at the Dodan Barracks, the military headquarters and presidential residence, when they were attacked and occupied by the rebel troops, but managed to escape by a back route. Orkar and 41 of his conspirators were countered, captured by government troops. They were convicted of treason. On 27 July 1990, they were executed by firing squad. On 12 December 1991, President Babangida relocated the seat of the federal government from Lagos to Abuja. In 1989, Babangida legalized the formation of political parties, and after a census was carried out in November 1991, the [ National Electoral Commission]] (NEC) announced on 24 January 1992 that both legislative elections to a bicameral National Assembly and a presidential election would be held later that year. A process of voting was adopted, referred to as Option A4. This process advocated that any candidate needed to pass through adoption from the local level to any height of governance. Babangida had formed two political parties, namely the SDP (Social Democratic Party) and NRC (National Republican Convention) for the elections. He urged all Nigerians to join either of the parties, which the late Chief Bola Ige famously referred to as "two leper hands." The two-party state had been a recommendation of the 17-member Political Bureau. The legislative elections went ahead as planned, with the Social Democratic Party (SDP) winning majorities in both houses of the National Assembly, but on 7 August 1992, the INEC annulled the first round of presidential primaries, alleging widespread irregularities. On 4 January 1993, Babangida announced a National Defense and Security Council (NDSC), of which he was president, while in April 1993, the SDP nominated Moshood Kashimawo Olawale Abiola (MKO) as its presidential candidate, with the National Republican Convention (NRC) choosing Bashir Tofa to run for the same position. On 12 June 1993, a presidential election was finally held, but no results were ever announced, because Babangida annulled the elections. It was however unofficially announced in some states that Abiola had won 19 of the 30 states. That Abiola had unofficially won the general election. The killing by a letter bomb of Dele Giwa, a magazine editor critical of Babangida's administration, at his Lagos home in 1986 was allegedly attributed to Babangida and remains a controversial incident to this day. In 1999, President Olusegun Obasanjo established the Human Rights Violation Investigation Commission headed by Justice Chukwudifu Oputa to investigate human rights abuses during Nigeria's decades of military rule. However, Babangida repeatedly defied summons to appear before the panel to answer allegations of humans rights abuses and questioned both the legality of the commission and its power to summon him. He was however represented by counsels, Mustapha Bashir Wali and Yahya Mahmoud. His right not to testify was upheld in 2001 by Nigeria's court of appeal which ruled that the panel did not have the power to summon former rulers of the country. The Oputa Panel Report would conclude that: "On General Ibrahim Babangida, we are of the view that there is evidence to suggest that he and the two security chiefs, Brigadier General Halilu Akilu and Col. A. K. Togun are accountable for the untimely death of Dele Giwa by letter bomb. We recommend that this case be re-opened for further investigation in the public interest." In an interview with the Financial Times on 15 August 2006, Babangida announced that he would run for president in Nigeria's 2007 national elections. He said he was doing so "under the banner of the Nigerian people" and accused the country's political elite of fuelling Nigeria's current ethnic and religious violence. On 8 November 2006, General Babangida picked up a nomination form from the Peoples Democratic Party Headquarters in Abuja, Nigeria. This effectively put to rest any speculation about his ambitions to run for the Presidency. His form was personally issued to him by the PDP chairman, Ahmadu Ali. This action immediately drew extreme reactions of support or opposition from the western population of the country. In early December, just before the PDP presidential primary, however, it was widely reported in Nigerian newspapers that IBB had withdrawn his candidacy to be the PDP's nominee to run for president. In a letter excerpted in the media, IBB is quoted as citing the "moral dilemma" of running against Umaru Yar'Adua, the younger brother of the late Shehu Yar'Adua (himself a former nominee to run for the Presidency during IBB's military regime), as well as against General Aliyu Mohammed Gusau, given IBB's close relationship with the latter two. It is widely believed that his chances of winning were slim. On 15 September 2010, Babangida officially declared his intention to run for the presidency in the general election at the Eagles Square in Abuja, Nigeria. Babangida later withdrew his nomination for the presidency, due to lack of support from party members. President Goodluck Jonathan was chosen by the PDP party to run for the 2011 general election. Gran Collar De La Orden De La Independencia translated as Grand Collar of the Order of the Independence was conferred on Babangida by President Teodoro Obiang Nguema Mbasogo of Equatorial Guinea on 12 December 1990. ^ a b c Lewis, Peter (March 1996). "From Prebendalism to Predation: The Political Economy of Decline in Nigeria". The Journal of Modern African Studies. 34 (1): 79–103. doi:10.1017/s0022278x0005521x. JSTOR 161739. ^ a b "Ibrahim Babangida 1941– Nigerian president and military officer". Encyclopedia.com. ^ Agbese, Dan (2012). Ibrahim Babangida: The Military, Power and Politics. Adonis & Abbey Publishers. pp. 19–40. ISBN 9781906704964. ^ a b Agbese (2012). Ibrahim Babangida. pp. 48–49. ^ Agbese (2012). Ibrahim Babangida. p. 83. ^ Siollun, Max (2009). Oil, Politics and Violence: Nigeria's Military Coup Culture (1966 - 1976). Algora. p. 97. ISBN 9780875867090. ^ Siollun, Max. "Buhari And Idiagbon: A Missed Opportunity For Nigeria". Gamji.com. Retrieved 1 April 2015. ^ "Leadership, Policy Making, and Economic Growth in African Countries: The Case of Nigeria" (PDF). ^ Iloegbunam, Chuks, "Nigeria: Perspectives: Jubril Aminu And Ebitu Ukiwe: the Main Point", Vanguard, 14 December 2004. ^ "How Nigeria got to 36 States (Timeline of State creation in Nigeria)". 2018-08-02. ^ Oyeniyi, Bukola Adeyemi; Falola, Toyin (February 2015). Nigeria. ABC-CLIO. p. 58. ^ "The Orkar Coup of April 22, 1990". ^ Omoigui, Nowa. "The Orkar Failed Coup of April 22, 1990 Part 2". Urhobo Historical Society. Retrieved 13 July 2015. ^ "The City as Public Space: Abuja - the Capital City of Nigeria" (PDF). ^ Campbell, Ian (1994). Nigeria's Failed Transition: The 1993 Presidential Election. Journal of Contemporary African Studies. pp. 179–199. ^ Human Rights Investigation Violation Investigation Commission of Nigeria (HRVIC) (May 2002). "HRVIC Report Volume Four - Case-by-Case Records of Public Hearings" (PDF). NigerianMuse. pp. 103–106. Retrieved 1 April 2015. ^ "Generals evade Nigeria rights panel". BBC News. 1 November 2001. ^ "Summary, Conclusions and Recommendations" (PDF). Human Rights Violations Investigation Commission (Nigeria). May 2002. ^ Mahtani, Dino (15 August 2006). "Former military ruler of Nigeria seeks presidency". Financial Times. ^ "Nigeria's 'evil genius' enters election race", IOL. ^ "Babangida to contest Nigeria poll". BBC News. 15 August 2006. ^ Ologbondiyan, Kola, Sufuyan Ojeifo and Oke Epia, "IBB: I Withdraw for Gusau, Yar`Adua"], This Day, 12 December 2006, p. 1. ^ "Blow to Babangida's Nigeria bid", BBC News (11 December 2006). ^ "IBB Formally Declares to Contest for President". 2010-09-15. Wikimedia Commons has media related to Ibrahim Babangida.